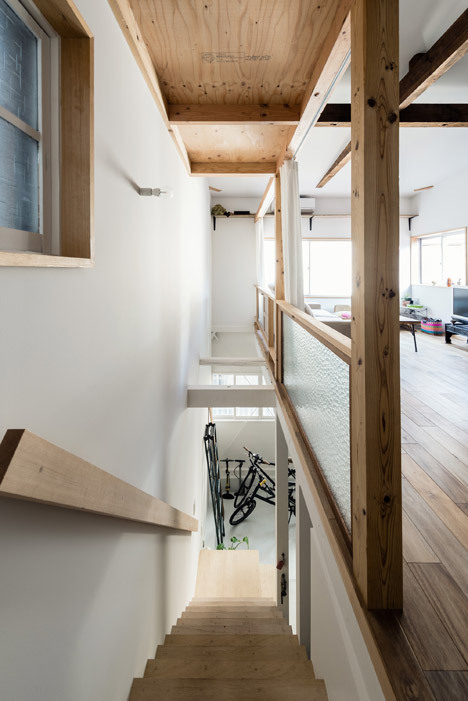 Japanese architect Kazuteru Matumura has gutted the interior of an old townhouse in Osaka, creating a minimal two-storey home that can be partitioned with curtains (+ slideshow). 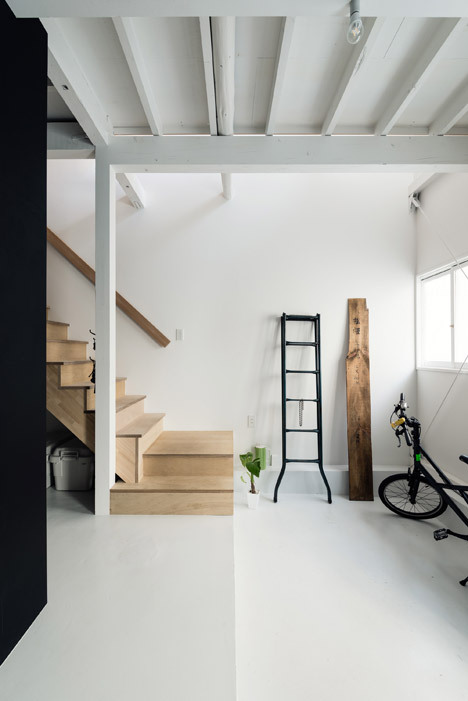 The architect, who runs an architecture studio called Coil, was tasked with renovating the small city-centre residence for its new owners – a young couple. He began by trying to the trace the building's history, but no records could be found to reveal its age. 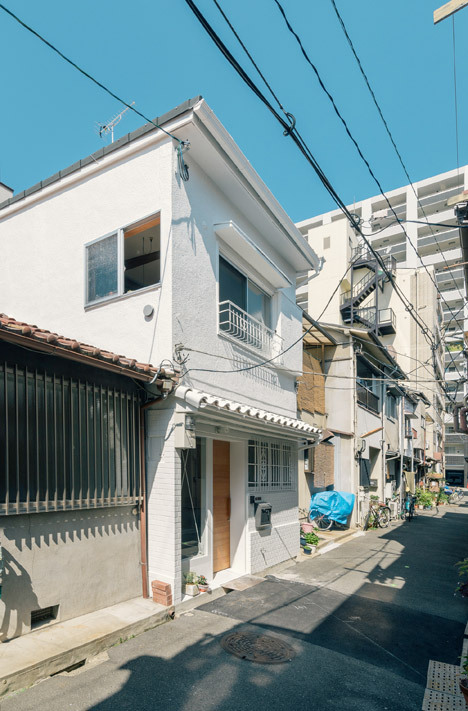 "The only thing we could find was that the house was renovated in the same year as the Olympics were held in Tokyo – 1964," he explained. 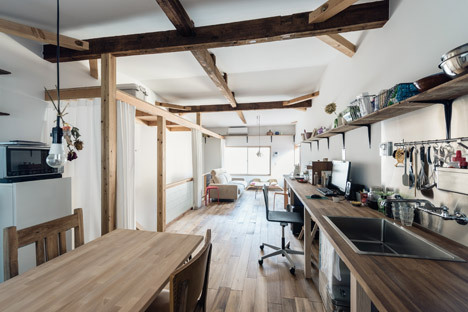 An aged interior was stripped back to reveal the building's original wooden framework, as well as the old electrical and plumbing fixtures. These were all upgraded to meet current regulations, and extra insulation was added within the walls. 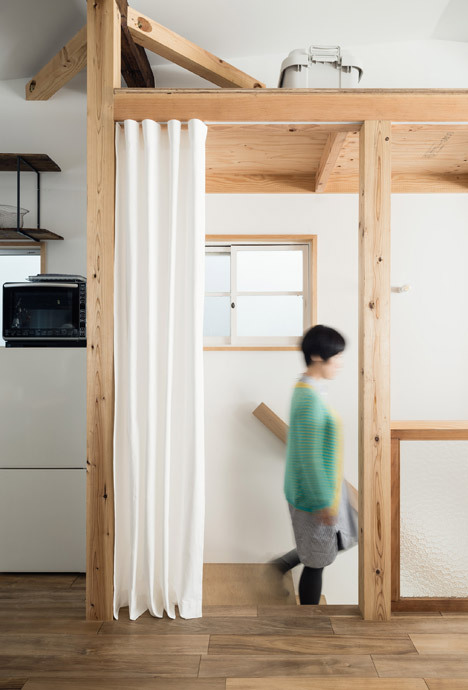 To maintain a sense of openness in the 64-square-metre property, Matumura added as few internal walls as possible and instead used curtains to create flexible partitions that will move in the breeze. 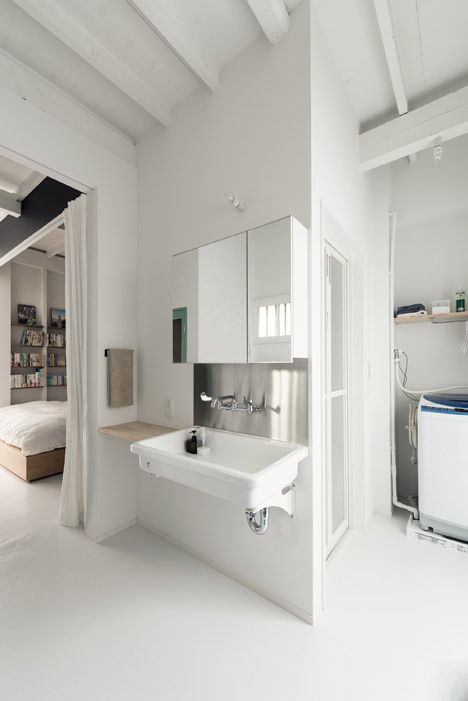 "The toilet and the bathroom were the only spaces where doors were installed," said the architect. 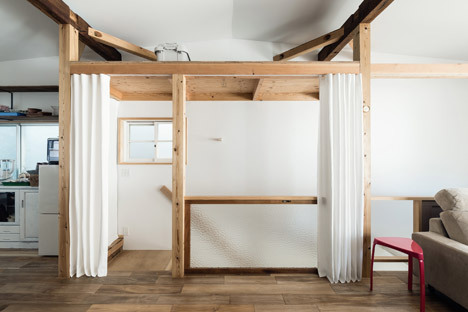 "The other spaces are softly divided by curtains in order to leave the option of having these areas either open or closed." The ground floor was divided up into three, forming an entrance lobby, a bedroom and the bathroom. The split-level lobby is the largest of these rooms, which the architect describes as "a luxury". 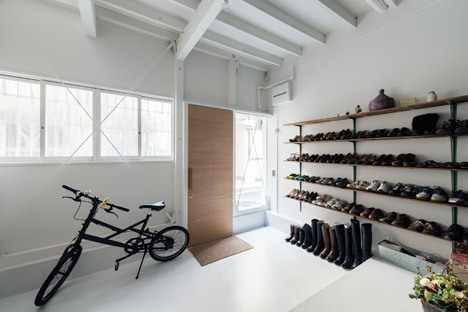 There is space for storing bicycles, as well as a set of shelves where shoes are stored and displayed. The bedroom sits just beyond, screened behind the house's only black-painted wall. 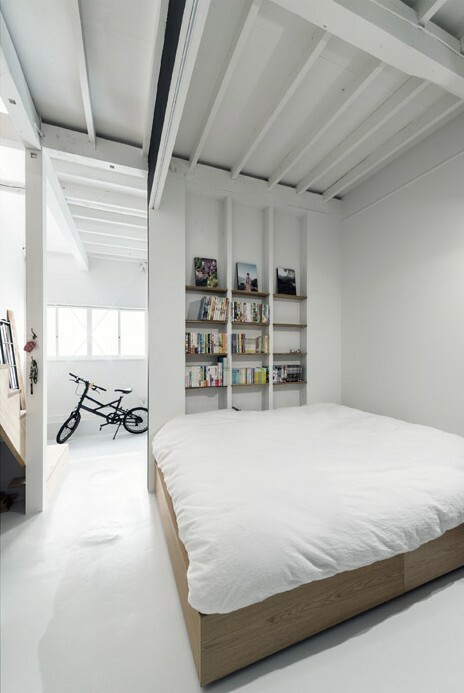 This room is not much larger than the bed itself, so storage is provided by recessed shelving and a built-in wardrobe. 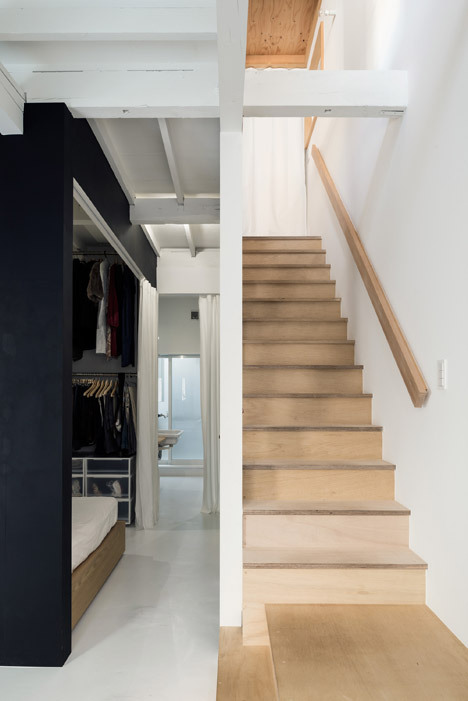 A wooden staircase ascends to the first floor and, to make the most of space, the toilet was slotted underneath. The upper level is one large room. 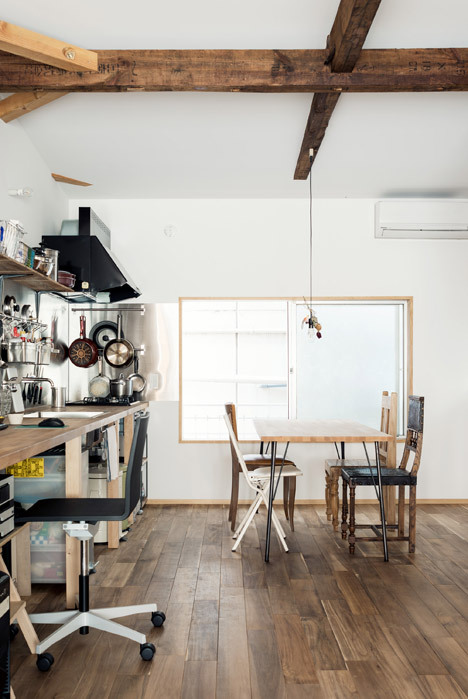 A living space is at the front, overlooking the street, while the rear is taken up by a kitchen area and a dining table. There is also a desk along one edge, offering a study area. There is almost no concealed storage, so many of the residents' belongings are on show, from pots and pans to computer equipment, books and a sewing machine. 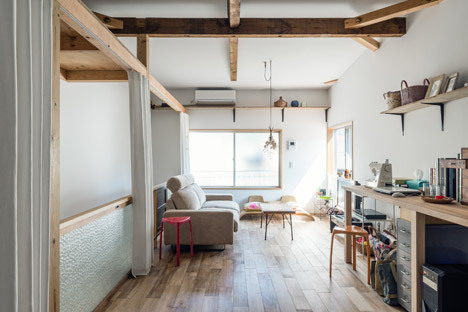 Wooden flooring was added, complementing the exposed ceiling beams overhead. 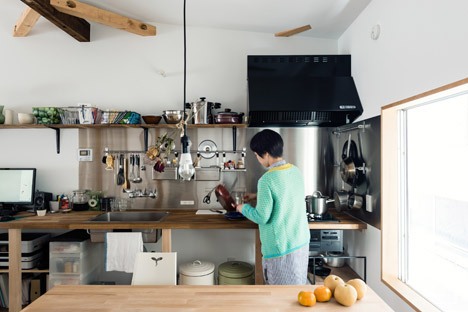 The kitchen counter, which becomes the study desk, also has a wooden surface. Materials salvaged from the original interior were reused where possible. 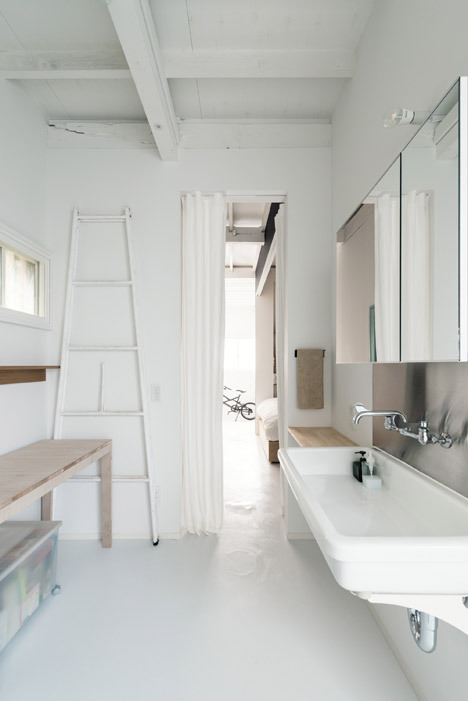 Old floorboards were repurposed as shelves, while the doors to the bathroom and toilet were recycled from elsewhere in the building. Photography is by Yoshiro Masuda.